Images of minerals often evoked a sense of naturalism, harmony, and beauty. Sometimes, minerals or geo-landscapes were depicted individually, allowing geologists to distinguish the numerous variations of a specific mineral or rock type. Sensitivity to the colour and texture of specimens enabled artists to capture the ‘rockiness’ of a specimen and avoid idealized representation. 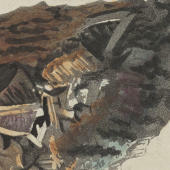 Chiaroscuro – the use of tonal contracts for modelling subjects – was a particularly useful technique in watercolours of minerals and rocks. During the period contemporary medical understanding of the senses, particularly vision, as well as aesthetic theories of the Picturesque, contributed to notions of the ‘natural’ in visual representation. 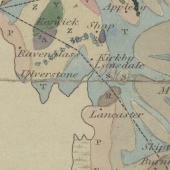 Outlines of the Geology of England and Wales, 1822. 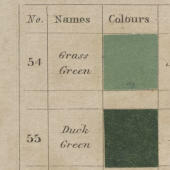 Werner’s Nomenclature of Colours, 1821. Specimens of British minerals selected from the cabinet of Philip Rashleigh, 1797.